And up-to-date today, "The King" Federer has now beeen de-throned again. After losing in the Indian Wells Final to Martin Del Potro, the Argentinian "Gentle Giant", in one of the recent "Sunshine Double" in the U.S.A. In the other one in Miami, he lost first-round to an unknown player. Or just another "giveme" #couldnotbebothered matches from Federer. So ending his short reign at the top. While that topsy-turvey world of professional world tennis continues in remarkable and commercial ways that it generates and spawns interests, the truth of local matters for non-professional tennis players is the nutty nutty world of politics. Yes we must also have adult talking pieces, or do we still 'chat' about tribal ineffectual football matters - "small-talk"? So it is that LineBallTennis - Clapham Common co-joins its activities in tennis coaching for one-and-all, with geo-political campaigning activistm (and merchandising exclusive brand tennis goods). 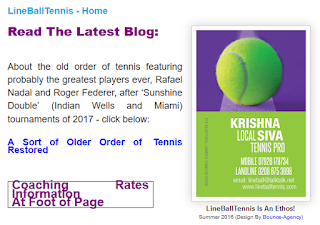 LineBallTennis recently committed to the UK Labour Party cause in helping them till 01/12/2020 to get the man of the hour and "the ideals 4 now" elected (starting with 3rd May elections to over-turn a 40-years led local Tory Council - Wandsworth). 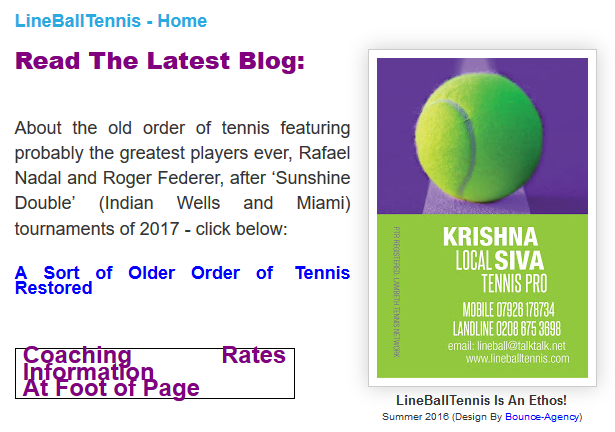 As per the activists Tweets we distribute via LBT principal Krishna through @LineBallTennis. All "RTs and Follows" appreciated but never for propaganda purpose, only towards the truth in interpretation. (12-Apr-18 - KS).